If you are looking for a tasty Paleo friendly, dairy and gluten free brunch that is also tasty and good for your health you are definitely in the right place. The other day I was lucky enough to stumble across a fantastic Facebook group called Pammy’s Paleo, Gluten Free and Dairy Free Recipe Group. This very friendly and helpful group is run by a lady who has multiple food intolerances. The thing you will notice if you visit her group is that she takes a practical approach to managing her food sensitivities, and she has a positive attitude, which I really like to see. Many of the recipes she finds and shares are very innovative. It just goes to show you what can be done when you set your mind to it. Best of all she has agreed to let me share one such recipe here. If you are looking for a nice brunch dish, or perhaps a starter for a special dinner this crab based recipe is a very good choice. You can find out more about which ingredients are gluten free, and which may contain hidden gluten, by clicking this link. That way you can follow in Pam’s footsteps and make up your own recipes. 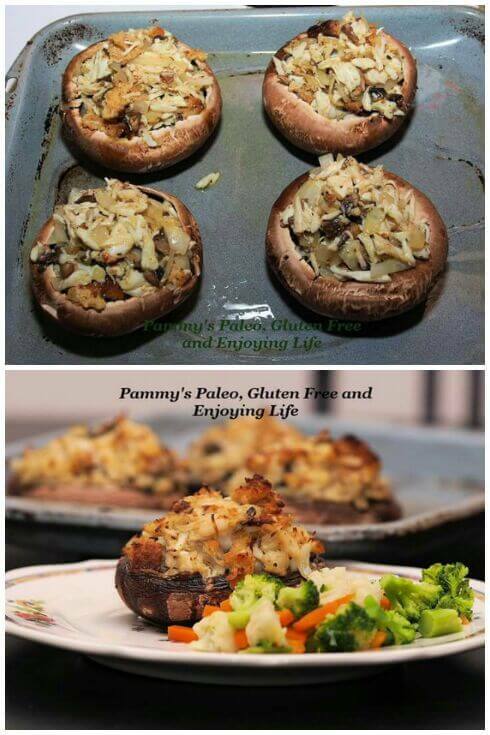 If you do that we would love to hear from you, in the meantime here is Pam’s tasty gluten free dish. First, drain your crab meat and put it into a large bowl. Toast your bread, then tear it into bite sized pieces and put those into a large bowl. Mix the other ingredients together apart from the olive oil, in your large bowl. Wash your Portobello mushrooms, and take out the centre stalk. If you want to you can chop up the stalks and lightly fry them and mix those in with the other ingredients. All you then need to do is to stuff your mushrooms with the mixture. Now, place them on a lightly greased pan (see picture 1). Lightly drizzle your mushrooms with your chosen oil. Place them at the top of a preheated 400 Degree oven and cook for 16 minutes. Check them halfway through and flip your pan around if needed to ensure even browning. Check them periodically and take them out when they turn golden brown (see picture 2). Serve while still warm, with a nice green salad, or do as Pam has here and serve them with some healthy steamed vegetables.